Serrapeptase supports healthy respiratory and sinus function, as well as muscle joint and overall tissue health. A concentrated natural proteolytic enzyme supplement. Our serrapeptase is enterically-coated to maximize efficacy, allowing the enzymes to survive the acidic conditions of the stomach, leading to greater absorption. 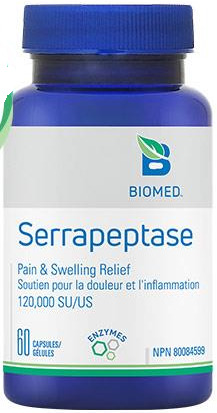 Serrapeptase - also known as serrapeptidase, serratiopeptidase and serratia peptidase - is a powerful proteolytic enzyme derived from a species of bacteria originally found in the intestine of silkworms. The bacterium, Serratia mercesans, produces the enzyme serrapeptase to enable the silkworm to dissolve its silken cocoon and emerge as a moth after metamorphosis. Serratia is now grown in cultures to produce serrapeptase by fermentation, and is suitable for vegetarians. Serrapeptase (Peptizyme SP) is one of the strongest in the world, unrivaled among products of its kind because it is packed with 120,000 SPU per capsule. Take 1 capsule once per day. Take 2 hours after a meal.